Local restaurant serving up fresh food with a huge beer and cocktail selection. From hand-made burgers, pizzas, and desserts Brick House Tavern + Tap has the best American comfort food to satisfy your cravings! Large groups welcome! The fried fish was a bit blain, the Thai chicken salad was a bit too basic, the pork chops were delicious but they were stingy on the potatoes (2 tablespoons worth is not enough). But the drinks were good even though the service was slow. We were there 1.5 hours - too long to bother with dessert. But loved the atmosphere and décor. We had family in town and my kitchen is under construction! We decided to take everyone out to eat instead of trying to navigate the mess I call my kitchen. The food was great and served in a timely fashion. What really made the experience great was our server. He was friendly, attentive and just about perfect in every way. We will surely come back more often for good food and great service. Thanks for hiring such good people! We reserved a table for 8 for Happy Hour on a Friday. Atmosphere was lively, but not crowded. Service was impeccable and food was delicious. We’ll be back! Food was great as always!!! Host was fun! Server was new but EXCELLENT! We’ll be back! The only odd thing about this experience was even though Open Table confirmed my reservation, the restaurant hostess told my friend who arrived before I did that 1) there was no reservation and 2) they don’t honor reservations for our group size during these hours. I had booked it for 8 people. Luckily, she was seated anyway with a table that ended up being for 6 which was the amount of friends that ended up making it. I realized this in the middle of dinner when I said “I thought my table reserved was for 8” and then she told me what the hostess told her. Makes you stop and think what the point of Open Table is the restaurants won’t honor it. I would highly advise calling the restaurant directly to confirm reservation from this app. Need more help on the service side. To help with large party's, drink orders and fold orders. Great place for date night, work lunch or family. Great drink selection. Appetizers and shareable plates offer wide variety. Main course selections were a plate full. Great food! Service top notch. I’d book on opentable as they get busy quick. Will recommend! Service was great! Food was just okay. Menu changed so wasn’t impressed. Used to be so good!!! May have to try something new again. Still good happy hour. Can’t go wrong there. The food was great! First time to try the brunch menu and we will be back. Our waitress was polite and prompt but not engaging. Service was amazing, especially since they were super busy during the Cowboys game! Loud and a bit hectic due to the Cowboys playoff game, but the tasty food and positive demeanor of our waiter more than made up for it. Will be back for sure! Food was ok service was awful! Waited 20 minutes to get drinks and then they brought out one kids meal while the rest if us waited for another 15 min. Just bad service. Would not go back. While the service was great the food was not. The chicken sandwich was overcooked and consisted of mostly breading. The steak wasn't seasoned and neither was the burger. It was disappointing, considering the first few times we went, the food and the service were exceptional. Basically poor food, poor service. Visited the location in Parker, CO last month and enjoyed it. Different experience here in Plano. Even asked them to tune a TV into the Dallas Mavericks game...that didn’t happen. Just an overly poor showing by Brick House. Thank you for such an awesome experience and great food. The waiter was great as well. They did not have our reservation that we booked they you. Loved it! New happy hour spot! I was there and organized the Election Watch Party. I really appreciate you accommodating us! Everyone had a great time. The service was a little slow, but it was understandable for the amount of people we had show up--just needed more wait staff for our party. Thank you again for allowing us the experience at your restaurant. I highly recommend your place for food, atmosphere and for special events or occasions! Love the new menu!! Great, football watch party with amazing food. 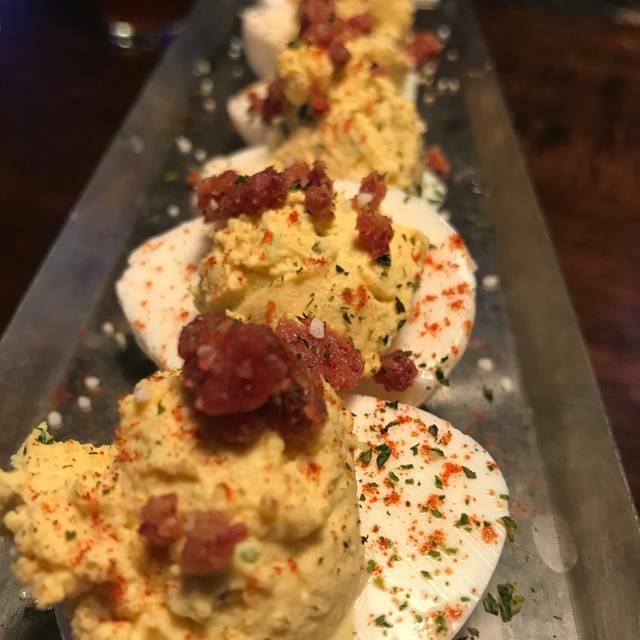 Kids loved the deviled eggs. East to get to, centrally located. Great menu with good selections and great cocktails! Great service, great food. Fun place that I’ll return. Rib were top notch! Service and food were good. It’s just a very very loud place. There was no band just loud from table chatter. Good food, great service and very tasty drinks for a reasonable price! Had to wait for over an hour for our food. My steak was super dry but the manager made it right and Compton our food. Food was just ok. Service about the same. Probably won’t return. The restaurant was really nice and busy because it was Mother’s Day. We ordered our food after about 15 to 20 minutes and it took over an hour for it to come out. Even then we had to send the chicken and waffles back because something green was on the inside of the waffle. The food tasted pretty good but didn’t look as pictured or described on the menu. I had the French toast with apples but the apples were very small and underwhelming. The waitress was kind but took too long to bring and pick up the check. Even then she charged the wrong amount to my card and it had to be voided. This was a super cute place but the service was very mediocre. Food quality has been deteriorating in last year (2017-2018$. Kitchen tends to get orders wrong. Great patio spot when the weather is nice. Brunch selection is phenomenal. We always come here for bloody Mary’s and mimosas! It was great for brunch!! Awesome staff & manager!! Food was delicious! Good value! Would definitely recommend & we’ll be back! Saturday night reservation for 6pm, not needed. Quickly sat without reference to open table reservation. Of course, didn't have a chance as hostess sat us quickly. We enjoyed the comfy seating. Issue is the table was higher so felt like Trex eating but overall it worked out. The atmosphere was pleasant, chill and overall an enjoyable evening. Our server Jarod was enjoyable. The pork chops were fantastic! I ate one and took the other home. My wife had the shrimp and chips with enough to to go. We should have listened to Jarod to get the Apple Crumb dessert vs. the soaked chocolate cake as it was not soaked. We would come back again for sure. Mediocre at best. Certainly the worst experience we've had with an OpenTable reservation. For a tap house, selection of beers on tap is rather limited. Even worse, they were out of the first three beers we ordered. The service lacked in every way. We were stopping other servers and food runners to complete our orders. We asked for extra dressing for an appetizer... No joy until we asked a passing staff member. We had to order drinks twice on two occasions to get them delivered. We had to flag down staff to get refills on water. We had to flag down staff to get the requisite place settings to eat. We specifically ordered my wife's salmon to be cooked with care so as not to have it dry. Fail. Although one of the drinks was comped and we got numerous apologies for the service, it's just in the 'too hard pile' to go through dinner fighting to get water, drinks, silverware and service. The food was great, music was great and the waitresses were very friendly! Service was a little slow and it was not crowded. We had to ask for napkins and silverware. Waitress was nice but was slow.